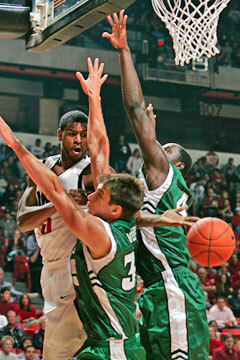 UNLV's Wendell White passed the ball between Hawaii's Ahmet Gueye, right, and Stephen Verwers last night in Las Vegas. LAS VEGAS » After falling behind by 19 points only 9 minutes into the game, the University of Hawaii basketball team nearly opened its regular season by pulling off an incredible come-from-behind victory on the road. But UNLV's Joel Anthony had other ideas. The Rainbow Warriors were held without a field goal for the final 6 minutes of the game as UNLV outscored Hawaii 15-3 over that period to pull away for a 73-59 victory last night in the season opener for both teams in front of a crowd of 9,284 at the Thomas and Mack Center. Senior Ahmet Gueye had 16 points and 12 rebounds and Matt Gibson scored 16 of his game-high 20 points in the second half, but the Warriors had no answer for Anthony, who dominated the paint with 10 points, eight rebounds and eight blocks. "He was their MVP tonight," Hawaii head coach Riley Wallace said. Wink Adams led four Rebels in double figures with 16 points. Joe Darger added 13 points and Kevin Kruger, son of UNLV coach Lon Kruger, had 12. The Rainbow Warriors were blitzed from the opening tip as UNLV opened the game on a 23-4 run. Hawaii had problems against a tight man-to-man defense from the Runnin' Rebels, and committed nine turnovers in the opening 9 minutes as they struggled just to get open looks at the basket. "We couldn't get into our offense," Wallace said. "They came out and put tremendous pressure on us, which we knew they would. We just didn't handle it." Matt Lojeski struggled from the field, finishing with nine points on just 3-for-13 shooting, but added nine rebounds and six assists as Hawaii slowly chipped away at UNLV's lead. Hawaii responded after falling behind 19 with a 10-0 run. A layup by Lojeski with a minute left got the Warriors back to within single digits, but Darger, who nailed four 3-pointers in the game, buried one of them from the corner to give the Runnin' Rebels a 38-27 halftime advantage. "It was kind of my fault," said Gueye. "He's a great shooter that I couldn't leave open, but sometimes I'd get caught up trying to help in the middle." Gibson, who had more turnovers (five) than points (four) in the first half, put Hawaii on his back to open the second half, hitting four 3-pointers as part of a 21-8 run to give Hawaii its only lead of the second half at 48-46. "We had so much time to get back in it, we just took it play by play and started to get some momentum," Gibson said. A layup by P.J. Owsley pulled Hawaii within two at 58-56 with 6:05 remaining, but it would be the last field goal of the game for the Warriors, who missed their final 13 shots. Hawaii finished with 19 turnovers, which the Rebels turned into 27 points, and seemed to run out of gas after fighting so hard just to get back into it. "You can't give up 27 points off turnovers -- that's really bad," Wallace said. "I give these guys credit, they didn't hang their heads and kept after it, but they had to expend so much energy getting back in it, and that's hard to do, especially with the amount of minutes our guys play." Gueye played all 40 minutes and was an instrumental part in helping the Rainbow Warriors outrebound UNLV 44-36. Hawaii also shared the ball well, dishing out 14 assists on 21 made baskets. "We have a great team with great chemistry and we showed we're tough enough to come back from a big early deficit," Gueye said. "We have some things to work on but we'll be ready." Hawaii has just three days to turn around and get ready for Coppin State, which comes into town for a game Monday. The Warriors will also get a shot at redemption against UNLV when the Runnin' Rebels visit Hawaii to take on the Warriors on Dec. 5. 3-point goals -- Hawaii 5-19 (Gibson 4-8, Waters 1-1, Luettgerodt 0-1, Nash 0-4, Lojeski 0-5), UNLV 7-22 (Darger 4-7, Adam 1-4, Kruger 1-4, Umeh 1-4, White 0-3). Personal fouls -- Hawaii 23, UNLV 15. Fouled out-- Gibson, Waters. Steals -- Hawaii 4 (Gibson 2, Verwers, Waters), UNLV 8 (Adams 3, Terry 2, White, Anthony, Kruger). Blocked shots --Hawaii 5, (Gueye 3, Verwers, Lojeski), UNLV 13, (Anthony 8, White 2, Kruger, Darger, Essngue. Turnovers -- Hawaii 19 (Gibson 6, Waters 5, Lojeski 3, Nash 2, Verwers, Luettgerodt, Follmer), UNLV 14 (Kruger 5, Adams 3, Umeh 2, White, Anthony, Lawrence, Essengue). Officials -- Hall, Thornlee, Giarratano. A -- 9,284.